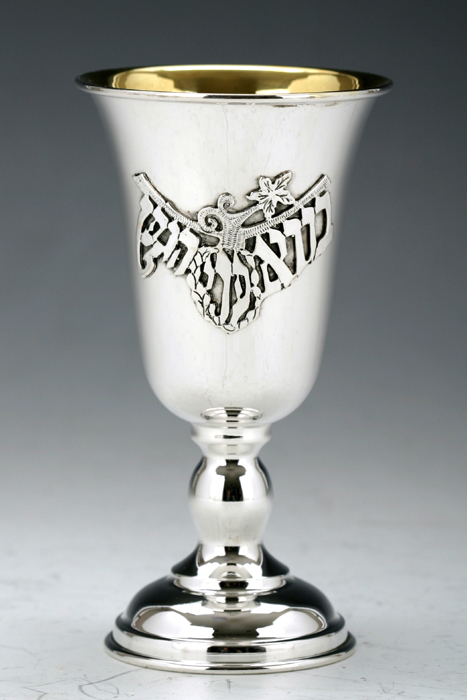 Hadad Silversmiths created this 925 Sterling Silver Kiddush Goblet to decorate your Shabbat & Holiday table.Made in Israel by Jewish Laborers.Wt 88g. The last three words of the Kiddush [Blessing on Wine] - Boreh Pri HaGafen - are engraved over a simple grapevine on this elegant Kiddush Goblet The matching sterling silver saucer is available for purchase separately to create a matching set. The cup holds the Shiur [halachic amount] of wine required for Kiddush and the Four cups of the Passover Seder. As only Jewish artists created this item, there is no need to Tovel [immersion in a Mikvah] it.